How do I transfer devices between Cable libraries? You have been e-mailed a library file (Cable.lib) containing a new cable device that does not currently exist in the library file (PTW.lib) on your computer. The new device is a 600V copper cable. It was created in the Standard Cable\Copper\LV library category. Step 1 - Copy this file to the (C:)\PTW32\Lib folder on your hard drive. 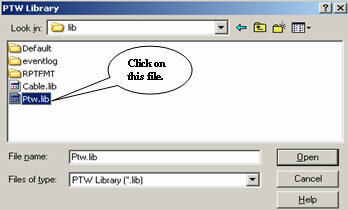 Step 3 - Open the existing PTW.lib file by selecting the Document pull-down menu. Select theLibrary menu item. 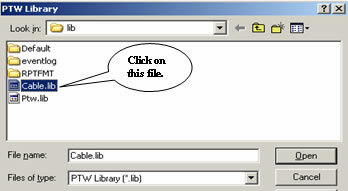 Step 4 - In the "Select Document Type" dialog, select "PTW Library" and click on the "OK" button. Step 6 - The new device exists in the Standard Cable\Copper\LV category of the library. Expand the Standard Cable library category by clicking on the "+" symbol. Expand Coppercategory by clicking on the "+" symbol. Select LV library category. Step 7 - Open the Cable.lib file containing the new cable by selecting the Document pull-down menu. Select the Library menu item. Step 9 - On the next window, select the Cable.lib file and click on the "Open" button. Step 10 - Cascade the windows by selecting the Window pull-down menu. Select the Cascademenu item. Step 11 - The new device exists in the Standard Cable\Copper\LV category of the library. Expand the Standard Cable library category by clicking on the "+" symbol. Expand Coppercategory by clicking on the "+" symbol. Select LV library category. 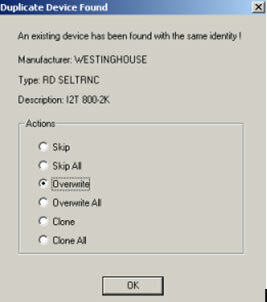 Step 13 - Select the Device pull-down menu again. Click on the Copy menu item. 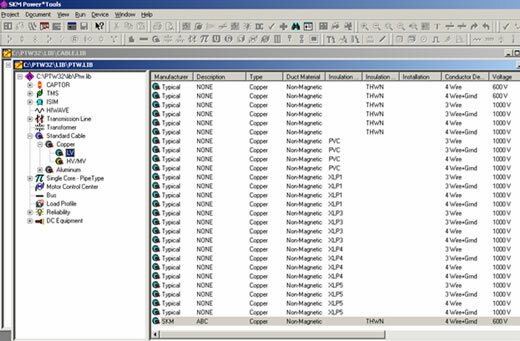 Step 14 - Bring the existing PTW.lib file back into focus, and expand the Standard Cable\Copper\LV library category. Notes: If the cable devices you are pasting into the destination library already exist, the following dialog will appear. Select the appropriate option and click on the "OK" button.